Back in 2016 I started a new hand drawn series that unfortunately stalled at 18 concepts. Dwindling inspiration, dissatisfaction with some the concepts and the decision to add helmet designs made me pull the plug and take a much needed break. Now I am back with a new series that I am truly proud of. I can say with complete confidence that I have given this new series every thing I have. I began working on new concepts at the start of 2017 and work has continued to this day. All 31 teams will be tackled and I plan on posting a new concept each day. Currently, 25 teams are completed so there will not a drop-off in material as there was on my last thread. I will kick things off with a team that just made its first Conference Final. 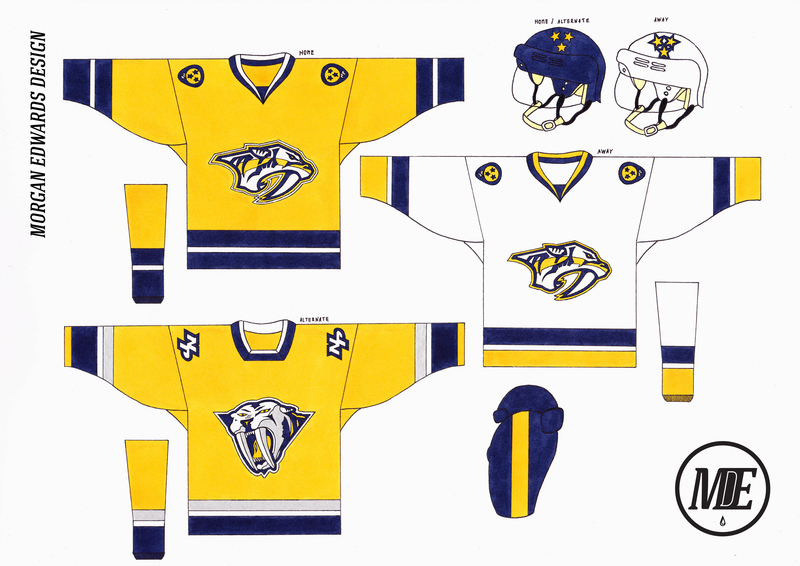 The Predators almost got things perfect with their 2011 redesign but a few bad decisions have them currently sitting in the middle of the pack. I removed the unnecessary piping and went with simple, traditional stripes. The Predators made gold more prominent on their road socks in 2013 so I decided to apply this change to the rest of the road uniform. It was tempting to go with a Navy alternate but I really wanted to make them the de-facto Gold team. The alternate adds silver to tip the hat to the pre 2011-look and the 3D logo has received a simplification in the same vein as the current primary. C & C welcome, thanks for looking . Those look great! I wouldn't change a thing. Nice work! Awesome to see you back at it. I like the Alt the best, but all look great. The simple pant stripe now actually fits in with the jersey design! I like the primaries quite a bit. I've always liked the guitar pick logo and the traditional stripes work. I'm not a fan of the collar or 3D logo on the second yellow option. I also think I prefer not having a gray stripe. I'm not sure what to make of the three stars on the helmet (yes I know the represent the state flag). I they are too big on this drawing, but in reality, it may be a decent look. These are really good! I didn't even think they were hand drawn for a second! Saw hand drawn in the title, and when I first saw the concept I didn't believe it was. Awesome job! As for the Preds, this is simple, sleek & nice. The only thing is that I can't help but look at that alternate and think that the template would work better for Tampa Bay of all teams with how you balanced the white & silver out. Can't wait to see the next team, and hopefully down the road we see you tackle other leagues in the hand drawn format. Thanks for all the kind words guys! On to another team in the final four. It seems like bashing the Senators roman theme has become as American as apple pie and Canadian as maple syrup. Certainly there has been a push to more subdued aesthetics but in my opinion, it has often come at the expense of creativity. For the main uniforms I decided to go all-in with the Centurion. I kept the striping somewhat traditional but added metallic gold and sublimated laurel leaf patterns (it's less effective on the road version but I was limited with my materials so please ignore the black outlines). 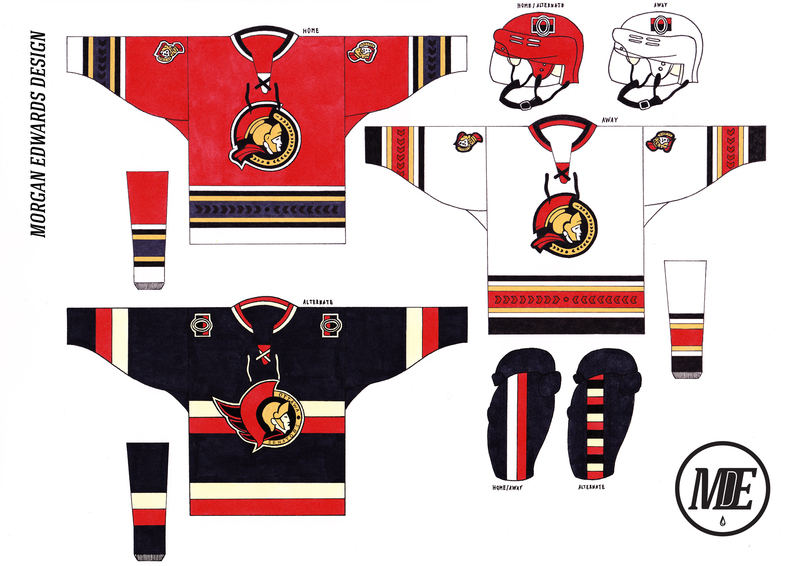 The goal was to set the team apart from the original Senators so it could forge its own identity. The =O= appears on the helmets as a subtle homage and lace up collars were implemented to balance out the more modern elements. For the alternate, I married the aesthetics of the heritage jersey with the original centurion and evened out the stripes. I also added a barber-pole pattern to the alternate pants as a homage to their somewhat busy original uniforms. C & C welcome as always and thanks for looking! 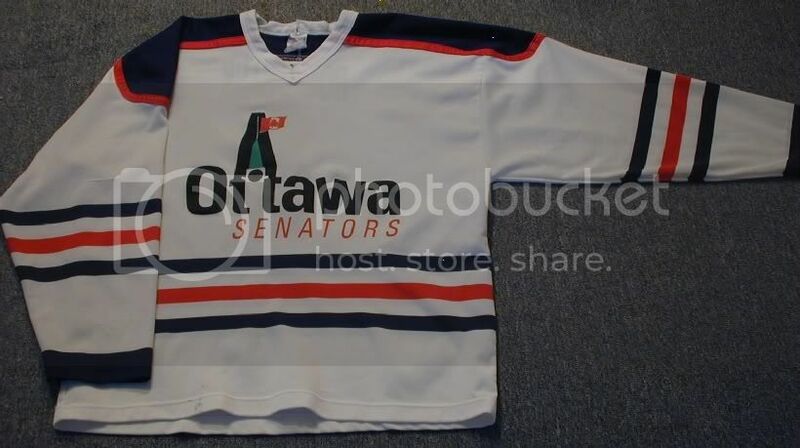 I really like the road and third unis you came up with for Ottawa, but I'd flip the black and white striping on the home. Kinda gives off a Hurricanes vibe, especially with the red helmet. Good work! That Ottawa 3rd is PERFECT. Truly a best of two worlds look. Awesome idea and great execution! These are all fantastic and very well rendered! Besides that, this a perfect merge of eras & I love the laurel leaf sublimation. I liked the peace-tower patch. 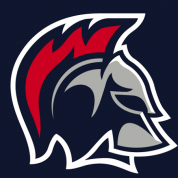 Though, the reason I went with the 3D centurion is because I'm a big fan of the old Toga jerseys. I loved how they had the 3D centurion on front and the 2D version on the shoulders. I just thought those logos really complimented each other well, hence doing the reverse for the main set. 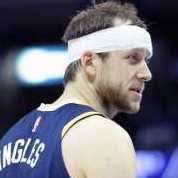 Good to have you back Morgo. I've always really admired the talent in these hand-drawn concepts. The Predators look really nice. You've managed to make that alternate logo look really good on a bright sweater. Ottawa looks fantastic. The only suggestion I have would be what OSM61 said; flip the home striping so that there's a bit more gold. Not sure if its the image quality but I've never been able to completely tell.. is that jersey is Oilers colors or is is it black & orange or black & red? Black and Red. it was basically a Blackhawks jersey with shoulder yokes. It's very difficult to improve upon perfection which is why the main set relies on small tweaks for added personality. The most important change was to give the road uniform hem stripes that matched its home counterpart. No more floating yellow stripe. I also changed the collar to a lace-up and went with a triangular yoke to better compliment the logo. Lastly, I added a sublimated 'steel' pattern to the cuffs to represent Pittsburgh's steel workers. For the alternate, I went with a modern take on the 90's alternate with a gold base. I made the striping super simple so it wouldn't take away from the chest stripe and put the 1992/93 logo front and center. I don't think it should ever be the primary but I think it has enough merits to serve as an alternate mark. It was tempting to put the skating penguin on the shoulders but I decided against it to keep things clean. C & C is very much appreciated, thanks for looking! It's very difficult to improve upon perfection which is why the main set relies on small tweaks for added personality. The most important change was to give the road uniform hem stripes that matched its home counterpart. No more floating yellow stripe. And a good one. 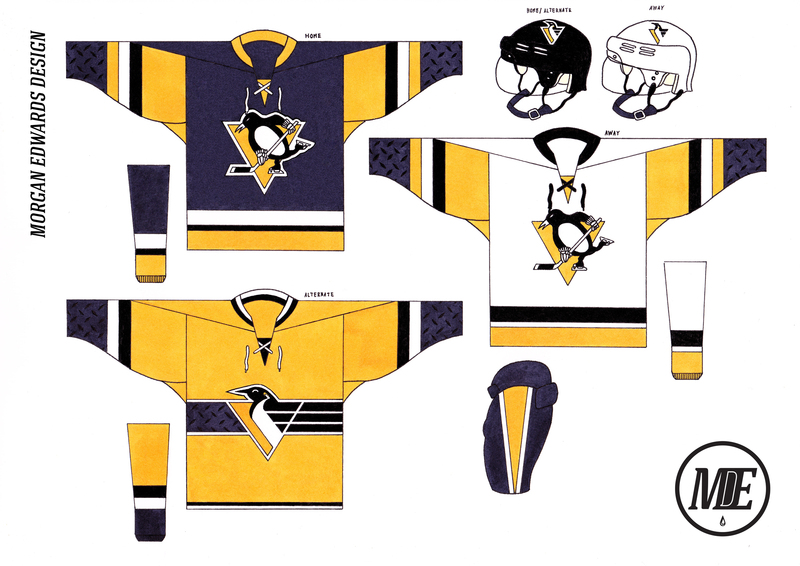 I recall the floating yellow stripe from the Lemieux days and was never a fan...it mad the Penguings a team with a pretty big gap between their home and road jerseys. 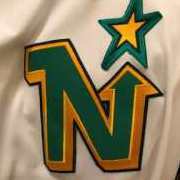 I also changed the collar to a lace-up and went with a triangular yoke to better compliment the logo. Lastly, I added a sublimated 'steel' pattern to the cuffs to represent Pittsburgh's steel workers. For the alternate, I went with a modern take on the 90's alternate with a gold base. I made the striping super simple so it wouldn't take away from the chest stripe and put the 1992/93 logo front and center. I don't think it should ever be the primary but I think it has enough merits to serve as an alternate mark. It was tempting to put the skating penguin on the shoulders but I decided against it to keep things clean. C & C is very much appreciated, thanks for looking! Not a fan of the laces...but I never am. Seems like change for change's sake. I can deal with the steel pattern. It's not necessary. 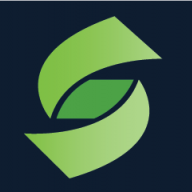 I suppose I can deal with the alternate having that mid-1990s logo. The jersey itself is a solid alt look. I'm always weary of teams appearing to almost have primary alternates, though. 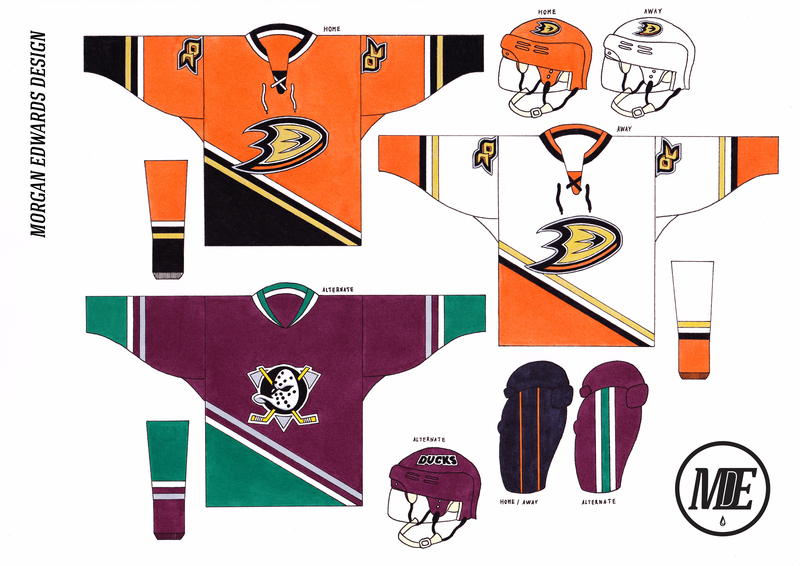 Therefore, I'd go with the skating penguin on the helmets. The one thing this team got right with their 2006 re-brand was the decision to carry over the diagonal stripes, albeit reversed and 'swooshed.' I decided to take that decision further by bringing back the original striping intact. The recent alternate inspired me to make orange the primary colour and I decided to go with orange helmets (a league first?) to set them apart from the Flyers. I thought the 'OC' patch looked really good on their stadium series uniform so I put it on both shoulders. The alternate is straight-up throwback to the mighty years and the helmet retains the original word-mark with "mighty" removed. C & C welcomed and appreciated, thanks for looking!